Emotional self-awareness involves identifying and understanding one’s emotions – including “big feelings” that can sometimes overwhelm us. As Fred Rogers reminds us: “When we can talk about our feelings, they become less overwhelming, less upsetting, and less scary.” Two-year-olds can learn the names of core emotions: happy, sad, scared, and excited. Naming emotions empowers toddlers and helps them understand what’s going on inside their mind and body. Help your child develop the skills necessary to navigate these strong feelings. Two-year-olds are still developing their expressive language skills. "Look at your smile! You are happy that you got to pet that soft, cute puppy." You can turn emotional vocabulary building into a game. You can turn emotional vocabulary building into a game. Take turns choosing a "feeling" word and then express it through exaggerated facial expressions and body language. Start with simple words like "happy" (big smiles, waving hands) and "sad" (frowning face, drooping shoulders). Let them look in the mirror or take a picture on your phone so they can see what they look like. As kids get the hang of it, add more complex words such as "excited," "surprised" and "frustrated." 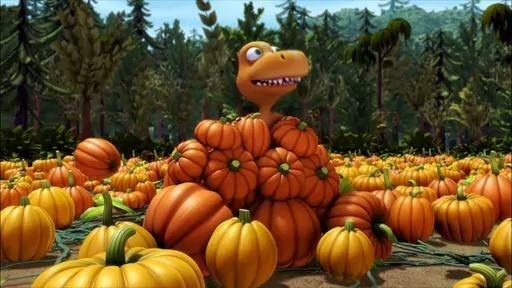 Buddy and his family visit a pumpkin patch.